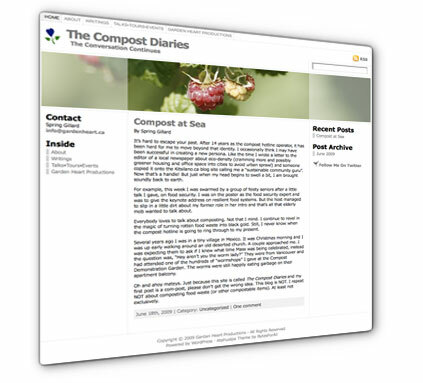 Author Spring Gillard has launched her new website with a funny article called Compost At Sea . It’s great to see her bringing her wit and wisdom to the internet. She’s well known in British Columbia for her work with City Farmer and her book Diary of a Compost Hotline Operator, Edible Essays on City Farming. She told me she’ll soon be selling the book online from the website, so check back soon – it’s entertaining and informative.